This manual describes common security problems in web applications and how to avoid them with Rails. All countermeasures that are highlighted. The concept of sessions in Rails, what to put in there and popular attack methods. How just visiting a site can be a security problem (with CSRF). What you have to pay attention to when working with files or providing an administration interface. How to manage users: Logging in and out and attack methods on all layers. And the most popular injection attack methods. Web application frameworks are made to help developers build web applications. Some of them also help you with securing the web application. In fact one framework is not more secure than another: If you use it correctly, you will be able to build secure apps with many frameworks. Ruby on Rails has some clever helper methods, for example against SQL injection, so that this is hardly a problem. In general there is no such thing as plug-n-play security. Security depends on the people using the framework, and sometimes on the development method. And it depends on all layers of a web application environment: The back-end storage, the web server and the web application itself (and possibly other layers or applications). The Gartner Group, however, estimates that 75% of attacks are at the web application layer, and found out "that out of 300 audited sites, 97% are vulnerable to attack". This is because web applications are relatively easy to attack, as they are simple to understand and manipulate, even by the lay person. The threats against web applications include user account hijacking, bypass of access control, reading or modifying sensitive data, or presenting fraudulent content. Or an attacker might be able to install a Trojan horse program or unsolicited e-mail sending software, aim at financial enrichment or cause brand name damage by modifying company resources. In order to prevent attacks, minimize their impact and remove points of attack, first of all, you have to fully understand the attack methods in order to find the correct countermeasures. That is what this guide aims at. In order to develop secure web applications you have to keep up to date on all layers and know your enemies. To keep up to date subscribe to security mailing lists, read security blogs and make updating and security checks a habit (check the Additional Resources chapter). It is done manually because that's how you find the nasty logical security problems. A good place to start looking at security is with sessions, which can be vulnerable to particular attacks. HTTP is a stateless protocol. Sessions make it stateful. Most applications need to keep track of certain state of a particular user. This could be the contents of a shopping basket or the user id of the currently logged in user. Without the idea of sessions, the user would have to identify, and probably authenticate, on every request. Rails will create a new session automatically if a new user accesses the application. It will load an existing session if the user has already used the application. The session ID is a 32-character random hex string. The session ID is generated using SecureRandom.hex which generates a random hex string using platform specific methods (such as OpenSSL, /dev/urandom or Win32 CryptoAPI) for generating cryptographically secure random numbers. Currently it is not feasible to brute-force Rails' session IDs. 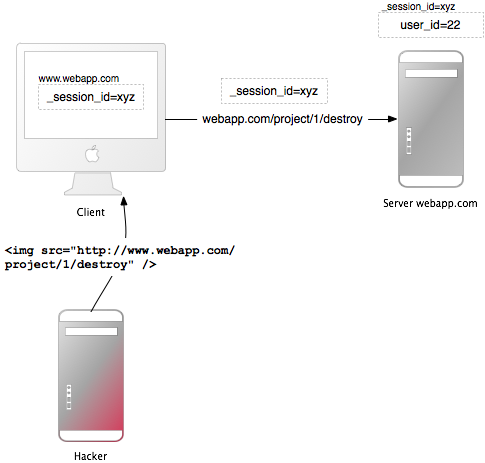 Stealing a user's session ID lets an attacker use the web application in the victim's name. Many web applications have an authentication system: a user provides a user name and password, the web application checks them and stores the corresponding user id in the session hash. From now on, the session is valid. On every request the application will load the user, identified by the user id in the session, without the need for new authentication. The session ID in the cookie identifies the session. Most people don't clear out the cookies after working at a public terminal. So if the last user didn't log out of a web application, you would be able to use it as this user. Provide the user with a log-out button in the web application, and make it prominent. Many cross-site scripting (XSS) exploits aim at obtaining the user's cookie. You'll read more about XSS later. Instead of stealing a cookie unknown to the attacker, they fix a user's session identifier (in the cookie) known to them. Read more about this so-called session fixation later. The main objective of most attackers is to make money. The underground prices for stolen bank login accounts range from $10-$1000 (depending on the available amount of funds), $0.40-$20 for credit card numbers, $1-$8 for online auction site accounts and $4-$30 for email passwords, according to the Symantec Global Internet Security Threat Report. Here are some general guidelines on sessions. Do not store large objects in a session. Instead you should store them in the database and save their id in the session. This will eliminate synchronization headaches and it won't fill up your session storage space (depending on what session storage you chose, see below). This will also be a good idea, if you modify the structure of an object and old versions of it are still in some user's cookies. With server-side session storages you can clear out the sessions, but with client-side storages, this is hard to mitigate. Critical data should not be stored in session. If the user clears their cookies or closes the browser, they will be lost. And with a client-side session storage, the user can read the data. Rails provides several storage mechanisms for the session hashes. The most important is ActionDispatch::Session::CookieStore. Cookies imply a strict size limit of 4kB. This is fine as you should not store large amounts of data in a session anyway, as described before. Storing the current user's database id in a session is common practice. Session cookies do not invalidate themselves and can be maliciously reused. It may be a good idea to have your application invalidate old session cookies using a stored timestamp. The CookieStore uses the encrypted cookie jar to provide a secure, encrypted location to store session data. Cookie-based sessions thus provide both integrity as well as confidentiality to their contents. The encryption key, as well as the verification key used for signed cookies, is derived from the secret_key_base configuration value. As of Rails 5.2 encrypted cookies and sessions are protected using AES GCM encryption. This form of encryption is a type of Authenticated Encryption and couples authentication and encryption in single step while also producing shorter ciphertexts as compared to other algorithms previously used. The key for cookies encrypted with AES GCM are derived using a salt value defined by the config.action_dispatch.authenticated_encrypted_cookie_salt configuration value. Prior to this version, encrypted cookies were secured using AES in CBC mode with HMAC using SHA1 for authentication. The keys for this type of encryption and for HMAC verification were derived via the salts defined by config.action_dispatch.encrypted_cookie_salt and config.action_dispatch.encrypted_signed_cookie_salt respectively. Prior to Rails version 4 in both versions 2 and 3, session cookies were protected using only HMAC verification. As such, these session cookies only provided integrity to their content because the actual session data was stored in plaintext encoded as base64. This is how signed cookies work in the current version of Rails. These kinds of cookies are still useful for protecting the integrity of certain client-stored data and information. Do not use a trivial secret for the secret_key_base, i.e. a word from a dictionary, or one which is shorter than 30 characters! Instead use rails secret to generate secret keys! It is also important to use different salt values for encrypted and signed cookies. Using the same value for different salt configuration values may lead to the same derived key being used for different security features which in turn may weaken the strength of the key. If you have received an application where the secret was exposed (e.g. an application whose source was shared), strongly consider changing the secret. Rotation is ideal for changing cookie configurations and ensuring old cookies aren't immediately invalid. Your users then have a chance to visit your site, get their cookie read with an old configuration and have it rewritten with the new change. The rotation can then be removed once you're comfortable enough users have had their chance to get their cookies upgraded. It's possible to rotate the ciphers and digests used for encrypted and signed cookies. Now add a rotation for the old SHA1 digest so existing cookies are seamlessly upgraded to the new SHA256 digest. Then any written signed cookies will be digested with SHA256. Old cookies that were written with SHA1 can still be read, and if accessed will be written with the new digest so they're upgraded and won't be invalid when you remove the rotation. Once users with SHA1 digested signed cookies should no longer have a chance to have their cookies rewritten, remove the rotation. While you can setup as many rotations as you'd like it's not common to have many rotations going at any one time. For more details on key rotation with encrypted and signed messages as well as the various options the rotate method accepts, please refer to the MessageEncryptor API and MessageVerifier API documentation. Another sort of attack you have to be aware of when using CookieStore is the replay attack. A user receives credits, the amount is stored in a session (which is a bad idea anyway, but we'll do this for demonstration purposes). The new adjusted credit value is stored in the session. The user takes the cookie from the first step (which they previously copied) and replaces the current cookie in the browser. The user has their original credit back. Including a nonce (a random value) in the session solves replay attacks. A nonce is valid only once, and the server has to keep track of all the valid nonces. It gets even more complicated if you have several application servers. Storing nonces in a database table would defeat the entire purpose of CookieStore (avoiding accessing the database). The best solution against it is not to store this kind of data in a session, but in the database. In this case store the credit in the database and the logged_in_user_id in the session. 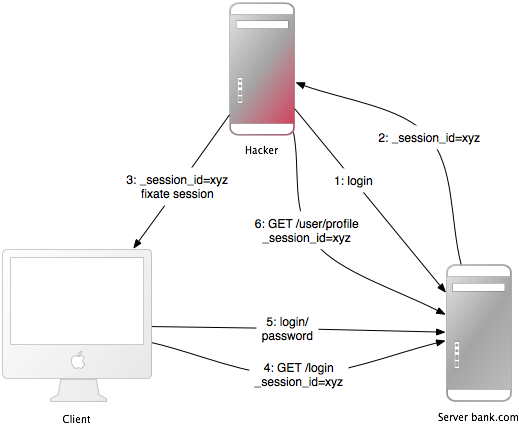 Apart from stealing a user's session ID, the attacker may fix a session ID known to them. This is called session fixation. The attacker creates a valid session ID: They load the login page of the web application where they want to fix the session, and take the session ID in the cookie from the response (see number 1 and 2 in the image). They maintain the session by accessing the web application periodically in order to keep an expiring session alive. As the new trap session is unused, the web application will require the user to authenticate. From now on, the victim and the attacker will co-use the web application with the same session: The session became valid and the victim didn't notice the attack. One line of code will protect you from session fixation. If you use the popular Devise gem for user management, it will automatically expire sessions on sign in and sign out for you. If you roll your own, remember to expire the session after your sign in action (when the session is created). This will remove values from the session, therefore you will have to transfer them to the new session. Another countermeasure is to save user-specific properties in the session, verify them every time a request comes in, and deny access, if the information does not match. Such properties could be the remote IP address or the user agent (the web browser name), though the latter is less user-specific. When saving the IP address, you have to bear in mind that there are Internet service providers or large organizations that put their users behind proxies. These might change over the course of a session, so these users will not be able to use your application, or only in a limited way. Sessions that never expire extend the time-frame for attacks such as cross-site request forgery (CSRF), session hijacking and session fixation. One possibility is to set the expiry time-stamp of the cookie with the session ID. However the client can edit cookies that are stored in the web browser so expiring sessions on the server is safer. Here is an example of how to expire sessions in a database table. Call Session.sweep("20 minutes") to expire sessions that were used longer than 20 minutes ago. This attack method works by including malicious code or a link in a page that accesses a web application that the user is believed to have authenticated. If the session for that web application has not timed out, an attacker may execute unauthorized commands. Bob's session at www.webapp.com is still alive, because he didn't log out a few minutes ago. By viewing the post, the browser finds an image tag. It tries to load the suspected image from www.webapp.com. As explained before, it will also send along the cookie with the valid session ID. The web application at www.webapp.com verifies the user information in the corresponding session hash and destroys the project with the ID 1. It then returns a result page which is an unexpected result for the browser, so it will not display the image. Bob doesn't notice the attack - but a few days later he finds out that project number one is gone. It is important to notice that the actual crafted image or link doesn't necessarily have to be situated in the web application's domain, it can be anywhere - in a forum, blog post or email. CSRF appears very rarely in CVE (Common Vulnerabilities and Exposures) - less than 0.1% in 2006 - but it really is a 'sleeping giant' [Grossman]. This is in stark contrast to the results in many security contract works - CSRF is an important security issue. First, as is required by the W3C, use GET and POST appropriately. Secondly, a security token in non-GET requests will protect your application from CSRF. The interaction is more like a question (i.e., it is a safe operation such as a query, read operation, or lookup). The user is held accountable for the results of the interaction. If your web application is RESTful, you might be used to additional HTTP verbs, such as PATCH, PUT or DELETE. Some legacy web browsers, however, do not support them - only GET and POST. Rails uses a hidden _method field to handle these cases. POST requests can be sent automatically, too. In this example, the link www.harmless.com is shown as the destination in the browser's status bar. But it has actually dynamically created a new form that sends a POST request. This will automatically include a security token in all forms and Ajax requests generated by Rails. If the security token doesn't match what was expected, an exception will be thrown. By default, Rails includes an unobtrusive scripting adapter, which adds a header called X-CSRF-Token with the security token on every non-GET Ajax call. Without this header, non-GET Ajax requests won't be accepted by Rails. When using another library to make Ajax calls, it is necessary to add the security token as a default header for Ajax calls in your library. To get the token, have a look at <meta name='csrf-token' content='THE-TOKEN'> tag printed by <%= csrf_meta_tags %> in your application view. The above method can be placed in the ApplicationController and will be called when a CSRF token is not present or is incorrect on a non-GET request. Note that cross-site scripting (XSS) vulnerabilities bypass all CSRF protections. XSS gives the attacker access to all elements on a page, so they can read the CSRF security token from a form or directly submit the form. Read more about XSS later. Another class of security vulnerabilities surrounds the use of redirection and files in web applications. Redirection in a web application is an underestimated cracker tool: Not only can the attacker forward the user to a trap web site, they may also create a self-contained attack. If it is at the end of the URL it will hardly be noticed and redirects the user to the attacker.com host. A simple countermeasure would be to include only the expected parameters in a legacy action (again a whitelist approach, as opposed to removing unexpected parameters). And if you redirect to a URL, check it with a whitelist or a regular expression. Make sure file uploads don't overwrite important files, and process media files asynchronously. Many web applications allow users to upload files. File names, which the user may choose (partly), should always be filtered as an attacker could use a malicious file name to overwrite any file on the server. If you store file uploads at /var/www/uploads, and the user enters a file name like "../../../etc/passwd", it may overwrite an important file. Of course, the Ruby interpreter would need the appropriate permissions to do so - one more reason to run web servers, database servers and other programs as a less privileged Unix user. A significant disadvantage of synchronous processing of file uploads (as the attachment_fu plugin may do with images), is its vulnerability to denial-of-service attacks. An attacker can synchronously start image file uploads from many computers which increases the server load and may eventually crash or stall the server. The solution to this is best to process media files asynchronously: Save the media file and schedule a processing request in the database. A second process will handle the processing of the file in the background. Source code in uploaded files may be executed when placed in specific directories. Do not place file uploads in Rails' /public directory if it is Apache's home directory. The popular Apache web server has an option called DocumentRoot. This is the home directory of the web site, everything in this directory tree will be served by the web server. If there are files with a certain file name extension, the code in it will be executed when requested (might require some options to be set). Examples for this are PHP and CGI files. Now think of a situation where an attacker uploads a file "file.cgi" with code in it, which will be executed when someone downloads the file. If your Apache DocumentRoot points to Rails' /public directory, do not put file uploads in it, store files at least one level upwards. Make sure users cannot download arbitrary files. Another (additional) approach is to store the file names in the database and name the files on the disk after the ids in the database. This is also a good approach to avoid possible code in an uploaded file to be executed. The attachment_fu plugin does this in a similar way. Intranet and administration interfaces are popular attack targets, because they allow privileged access. Although this would require several extra-security measures, the opposite is the case in the real world. In 2007 there was the first tailor-made trojan which stole information from an Intranet, namely the "Monster for employers" web site of Monster.com, an online recruitment web application. Tailor-made Trojans are very rare, so far, and the risk is quite low, but it is certainly a possibility and an example of how the security of the client host is important, too. However, the highest threat to Intranet and Admin applications are XSS and CSRF. XSS If your application re-displays malicious user input from the extranet, the application will be vulnerable to XSS. User names, comments, spam reports, order addresses are just a few uncommon examples, where there can be XSS. Having one single place in the admin interface or Intranet, where the input has not been sanitized, makes the entire application vulnerable. Possible exploits include stealing the privileged administrator's cookie, injecting an iframe to steal the administrator's password or installing malicious software through browser security holes to take over the administrator's computer. Refer to the Injection section for countermeasures against XSS. CSRF Cross-Site Request Forgery (CSRF), also known as Cross-Site Reference Forgery (XSRF), is a gigantic attack method, it allows the attacker to do everything the administrator or Intranet user may do. As you have already seen above how CSRF works, here are a few examples of what attackers can do in the Intranet or admin interface. A real-world example is a router reconfiguration by CSRF. The attackers sent a malicious e-mail, with CSRF in it, to Mexican users. The e-mail claimed there was an e-card waiting for the user, but it also contained an image tag that resulted in an HTTP-GET request to reconfigure the user's router (which is a popular model in Mexico). The request changed the DNS-settings so that requests to a Mexico-based banking site would be mapped to the attacker's site. Everyone who accessed the banking site through that router saw the attacker's fake web site and had their credentials stolen. Another example changed Google Adsense's e-mail address and password. If the victim was logged into Google Adsense, the administration interface for Google advertisement campaigns, an attacker could change the credentials of the victim. Another popular attack is to spam your web application, your blog or forum to propagate malicious XSS. Of course, the attacker has to know the URL structure, but most Rails URLs are quite straightforward or they will be easy to find out, if it is an open-source application's admin interface. The attacker may even do 1,000 lucky guesses by just including malicious IMG-tags which try every possible combination. For countermeasures against CSRF in administration interfaces and Intranet applications, refer to the countermeasures in the CSRF section. It is very important to think about the worst case: What if someone really got hold of your cookies or user credentials. You could introduce roles for the admin interface to limit the possibilities of the attacker. Or how about special login credentials for the admin interface, other than the ones used for the public part of the application. Or a special password for very serious actions? Does the admin really have to access the interface from everywhere in the world? Think about limiting the login to a bunch of source IP addresses. Examine request.remote_ip to find out about the user's IP address. This is not bullet-proof, but a great barrier. Remember that there might be a proxy in use, though. Put the admin interface to a special subdomain such as admin.application.com and make it a separate application with its own user management. This makes stealing an admin cookie from the usual domain, www.application.com, impossible. This is because of the same origin policy in your browser: An injected (XSS) script on www.application.com may not read the cookie for admin.application.com and vice-versa. Almost every web application has to deal with authorization and authentication. Instead of rolling your own, it is advisable to use common plug-ins. But keep them up-to-date, too. A few additional precautions can make your application even more secure. There are a number of authentication plug-ins for Rails available. Good ones, such as the popular devise and authlogic, store only encrypted passwords, not plain-text passwords. In Rails 3.1 you can use the built-in has_secure_password method which has similar features. And thus it found the first user in the database, returned it and logged them in. You can find out more about it in this blog post. It is advisable to update your plug-ins from time to time. Moreover, you can review your application to find more flaws like this. Brute-force attacks on accounts are trial and error attacks on the login credentials. Fend them off with more generic error messages and possibly require to enter a CAPTCHA. A list of user names for your web application may be misused to brute-force the corresponding passwords, because most people don't use sophisticated passwords. Most passwords are a combination of dictionary words and possibly numbers. So armed with a list of user names and a dictionary, an automatic program may find the correct password in a matter of minutes. Because of this, most web applications will display a generic error message "user name or password not correct", if one of these are not correct. If it said "the user name you entered has not been found", an attacker could automatically compile a list of user names. However, what most web application designers neglect, are the forgot-password pages. These pages often admit that the entered user name or e-mail address has (not) been found. This allows an attacker to compile a list of user names and brute-force the accounts. In order to mitigate such attacks, display a generic error message on forgot-password pages, too. Moreover, you can require to enter a CAPTCHA after a number of failed logins from a certain IP address. Note, however, that this is not a bullet-proof solution against automatic programs, because these programs may change their IP address exactly as often. However, it raises the barrier of an attack. Many web applications make it easy to hijack user accounts. Why not be different and make it more difficult?. Think of a situation where an attacker has stolen a user's session cookie and thus may co-use the application. If it is easy to change the password, the attacker will hijack the account with a few clicks. Or if the change-password form is vulnerable to CSRF, the attacker will be able to change the victim's password by luring them to a web page where there is a crafted IMG-tag which does the CSRF. As a countermeasure, make change-password forms safe against CSRF, of course. And require the user to enter the old password when changing it. However, the attacker may also take over the account by changing the e-mail address. After they change it, they will go to the forgotten-password page and the (possibly new) password will be mailed to the attacker's e-mail address. As a countermeasure require the user to enter the password when changing the e-mail address, too. Depending on your web application, there may be more ways to hijack the user's account. In many cases CSRF and XSS will help to do so. For example, as in a CSRF vulnerability in Google Mail. In this proof-of-concept attack, the victim would have been lured to a web site controlled by the attacker. On that site is a crafted IMG-tag which results in an HTTP GET request that changes the filter settings of Google Mail. If the victim was logged in to Google Mail, the attacker would change the filters to forward all e-mails to their e-mail address. This is nearly as harmful as hijacking the entire account. As a countermeasure, review your application logic and eliminate all XSS and CSRF vulnerabilities. A CAPTCHA is a challenge-response test to determine that the response is not generated by a computer. It is often used to protect registration forms from attackers and comment forms from automatic spam bots by asking the user to type the letters of a distorted image. This is the positive CAPTCHA, but there is also the negative CAPTCHA. The idea of a negative CAPTCHA is not for a user to prove that they are human, but reveal that a robot is a robot. A popular positive CAPTCHA API is reCAPTCHA which displays two distorted images of words from old books. It also adds an angled line, rather than a distorted background and high levels of warping on the text as earlier CAPTCHAs did, because the latter were broken. As a bonus, using reCAPTCHA helps to digitize old books. ReCAPTCHA is also a Rails plug-in with the same name as the API. You will get two keys from the API, a public and a private key, which you have to put into your Rails environment. After that you can use the recaptcha_tags method in the view, and the verify_recaptcha method in the controller. Verify_recaptcha will return false if the validation fails. The problem with CAPTCHAs is that they have a negative impact on the user experience. Additionally, some visually impaired users have found certain kinds of distorted CAPTCHAs difficult to read. Still, positive CAPTCHAs are one of the best methods to prevent all kinds of bots from submitting forms. Note that negative CAPTCHAs are only effective against dumb bots and won't suffice to protect critical applications from targeted bots. Still, the negative and positive CAPTCHAs can be combined to increase the performance, e.g., if the "honeypot" field is not empty (bot detected), you won't need to verify the positive CAPTCHA, which would require an HTTPS request to Google ReCaptcha before computing the response. The most simple negative CAPTCHA is one hidden honeypot field. On the server side, you will check the value of the field: If it contains any text, it must be a bot. Then, you can either ignore the post or return a positive result, but not saving the post to the database. This way the bot will be satisfied and moves on. Include a field with the current UTC time-stamp in it and check it on the server. If it is too far in the past, or if it is in the future, the form is invalid. Note that this protects you only from automatic bots, targeted tailor-made bots cannot be stopped by this. So negative CAPTCHAs might not be good to protect login forms. Tell Rails not to put passwords in the log files. By default, Rails logs all requests being made to the web application. But log files can be a huge security issue, as they may contain login credentials, credit card numbers et cetera. When designing a web application security concept, you should also think about what will happen if an attacker got (full) access to the web server. Encrypting secrets and passwords in the database will be quite useless, if the log files list them in clear text. You can filter certain request parameters from your log files by appending them to config.filter_parameters in the application configuration. These parameters will be marked [FILTERED] in the log. Provided parameters will be filtered out by partial matching regular expression. Rails adds default :password in the appropriate initializer (initializers/filter_parameter_logging.rb) and cares about typical application parameters password and password_confirmation. Do you find it hard to remember all your passwords? Don't write them down, but use the initial letters of each word in an easy to remember sentence. password1, abc123, myspace1, password, blink182, qwerty1, ****you, 123abc, baseball1, football1, 123456, soccer, monkey1, liverpool1, princess1, jordan23, slipknot1, superman1, iloveyou1, and monkey. It is interesting that only 4% of these passwords were dictionary words and the great majority is actually alphanumeric. However, password cracker dictionaries contain a large number of today's passwords, and they try out all kinds of (alphanumerical) combinations. If an attacker knows your user name and you use a weak password, your account will be easily cracked. A good password is a long alphanumeric combination of mixed cases. As this is quite hard to remember, it is advisable to enter only the first letters of a sentence that you can easily remember. For example "The quick brown fox jumps over the lazy dog" will be "Tqbfjotld". Note that this is just an example, you should not use well known phrases like these, as they might appear in cracker dictionaries, too. A common pitfall in Ruby's regular expressions is to match the string's beginning and end by ^ and $, instead of \A and \z. Note that this only protects you against the most common mistake when using the format validator - you always need to keep in mind that ^ and $ match the line beginning and line end in Ruby, and not the beginning and end of a string. Changing a single parameter may give the user unauthorized access. Remember that every parameter may be changed, no matter how much you hide or obfuscate it. Depending on your web application, there will be many more parameters the user can tamper with. As a rule of thumb, no user input data is secure, until proven otherwise, and every parameter from the user is potentially manipulated. Injection is a class of attacks that introduce malicious code or parameters into a web application in order to run it within its security context. Prominent examples of injection are cross-site scripting (XSS) and SQL injection. Injection is very tricky, because the same code or parameter can be malicious in one context, but totally harmless in another. A context can be a scripting, query or programming language, the shell or a Ruby/Rails method. The following sections will cover all important contexts where injection attacks may happen. The first section, however, covers an architectural decision in connection with Injection. When sanitizing, protecting or verifying something, prefer whitelists over blacklists. Use before_action except: [...] instead of only: [...] for security-related actions. This way you don't forget to enable security checks for newly added actions. Allow <strong> instead of removing <script> against Cross-Site Scripting (XSS). See below for details. Whitelists are also a good approach against the human factor of forgetting something in the blacklist. Thanks to clever methods, this is hardly a problem in most Rails applications. However, this is a very devastating and common attack in web applications, so it is important to understand the problem. The two dashes start a comment ignoring everything after it. So the query returns all records from the projects table including those blind to the user. This is because the condition is true for all records. Usually a web application includes access control. The user enters their login credentials and the web application tries to find the matching record in the users table. The application grants access when it finds a record. However, an attacker may possibly bypass this check with SQL injection. The following shows a typical database query in Rails to find the first record in the users table which matches the login credentials parameters supplied by the user. This will simply find the first record in the database, and grants access to this user. The result won't be a list of projects (because there is no project with an empty name), but a list of user names and their password. So hopefully you encrypted the passwords in the database! The only problem for the attacker is, that the number of columns has to be the same in both queries. That's why the second query includes a list of ones (1), which will be always the value 1, in order to match the number of columns in the first query. Also, the second query renames some columns with the AS statement so that the web application displays the values from the user table. Be sure to update your Rails to at least 2.1.1. Ruby on Rails has a built-in filter for special SQL characters, which will escape ' , " , NULL character and line breaks. Using Model.find(id) or Model.find_by_some thing(something) automatically applies this countermeasure. But in SQL fragments, especially in conditions fragments (where("...")), the connection.execute() or Model.find_by_sql() methods, it has to be applied manually. The array or hash form is only available in model instances. You can try sanitize_sql() elsewhere. Make it a habit to think about the security consequences when using an external string in SQL. The most widespread, and one of the most devastating security vulnerabilities in web applications is XSS. This malicious attack injects client-side executable code. Rails provides helper methods to fend these attacks off. An entry point is a vulnerable URL and its parameters where an attacker can start an attack. The most common entry points are message posts, user comments, and guest books, but project titles, document names and search result pages have also been vulnerable - just about everywhere where the user can input data. But the input does not necessarily have to come from input boxes on web sites, it can be in any URL parameter - obvious, hidden or internal. Remember that the user may intercept any traffic. Applications or client-site proxies make it easy to change requests. There are also other attack vectors like banner advertisements. XSS attacks work like this: An attacker injects some code, the web application saves it and displays it on a page, later presented to a victim. Most XSS examples simply display an alert box, but it is more powerful than that. XSS can steal the cookie, hijack the session, redirect the victim to a fake website, display advertisements for the benefit of the attacker, change elements on the web site to get confidential information or install malicious software through security holes in the web browser. During the second half of 2007, there were 88 vulnerabilities reported in Mozilla browsers, 22 in Safari, 18 in IE, and 12 in Opera. The Symantec Global Internet Security threat report also documented 239 browser plug-in vulnerabilities in the last six months of 2007. Mpack is a very active and up-to-date attack framework which exploits these vulnerabilities. For criminal hackers, it is very attractive to exploit an SQL-Injection vulnerability in a web application framework and insert malicious code in every textual table column. In April 2008 more than 510,000 sites were hacked like this, among them the British government, United Nations, and many more high profile targets. For an attacker, of course, this is not useful, as the victim will see their own cookie. The next example will try to load an image from the URL http://www.attacker.com/ plus the cookie. Of course this URL does not exist, so the browser displays nothing. But the attacker can review their web server's access log files to see the victim's cookie. It is very important to filter malicious input, but it is also important to escape the output of the web application. Especially for XSS, it is important to do whitelist input filtering instead of blacklist. Whitelist filtering states the values allowed as opposed to the values not allowed. Blacklists are never complete. This allows only the given tags and does a good job, even against all kinds of tricks and malformed tags. As a second step, it is good practice to escape all output of the application, especially when re-displaying user input, which hasn't been input-filtered (as in the search form example earlier on). Use escapeHTML() (or its alias h()) method to replace the HTML input characters &, ", <, and > by their uninterpreted representations in HTML (&amp;, &quot;, &lt;, and &gt;). This example pops up a message box. It will be recognized by the above sanitize() filter, though. A great tool to obfuscate and encode strings, and thus "get to know your enemy", is the Hackvertor. Rails' sanitize() method does a good job to fend off encoding attacks. In order to understand today's attacks on web applications, it's best to take a look at some real-world attack vectors. Another proof-of-concept webmail worm is Nduja, a cross-domain worm for four Italian webmail services. Find more details on Rosario Valotta's paper. Both webmail worms have the goal to harvest email addresses, something a criminal hacker could make money with. In December 2006, 34,000 actual user names and passwords were stolen in a MySpace phishing attack. The idea of the attack was to create a profile page named "login_home_index_html", so the URL looked very convincing. Specially-crafted HTML and CSS was used to hide the genuine MySpace content from the page and instead display its own login form. CSS Injection is explained best by the well-known MySpace Samy worm. This worm automatically sent a friend request to Samy (the attacker) simply by visiting his profile. Within several hours he had over 1 million friend requests, which created so much traffic that MySpace went offline. The following is a technical explanation of that worm. Another problem for the worm's author was the CSRF security tokens. Without them he couldn't send a friend request over POST. He got around it by sending a GET to the page right before adding a user and parsing the result for the CSRF token. In the end, he got a 4 KB worm, which he injected into his profile page. This example, again, showed that a blacklist filter is never complete. However, as custom CSS in web applications is a quite rare feature, it may be hard to find a good whitelist CSS filter. If you want to allow custom colors or images, you can allow the user to choose them and build the CSS in the web application. Use Rails' sanitize() method as a model for a whitelist CSS filter, if you really need one. If you want to provide text formatting other than HTML (due to security), use a mark-up language which is converted to HTML on the server-side. RedCloth is such a language for Ruby, but without precautions, it is also vulnerable to XSS. Use the :filter_html option to remove HTML which was not created by the Textile processor. It is recommended to use RedCloth in combination with a whitelist input filter, as described in the countermeasures against XSS section. The same security precautions have to be taken for Ajax actions as for "normal" ones. There is at least one exception, however: The output has to be escaped in the controller already, if the action doesn't render a view. If you use the in_place_editor plugin, or actions that return a string, rather than rendering a view, you have to escape the return value in the action. Otherwise, if the return value contains a XSS string, the malicious code will be executed upon return to the browser. Escape any input value using the h() method. Use user-supplied command line parameters with caution. If your application has to execute commands in the underlying operating system, there are several methods in Ruby: exec(command), syscall(command), system(command) and command. You will have to be especially careful with these functions if the user may enter the whole command, or a part of it. This is because in most shells, you can execute another command at the end of the first one, concatenating them with a semicolon (;) or a vertical bar (|). A countermeasure is to use the system(command, parameters) method which passes command line parameters safely. HTTP headers are dynamically generated and under certain circumstances user input may be injected. This can lead to false redirection, XSS or HTTP response splitting. HTTP request headers have a Referer, User-Agent (client software), and Cookie field, among others. Response headers for example have a status code, Cookie and Location (redirection target URL) field. All of them are user-supplied and may be manipulated with more or less effort. Remember to escape these header fields, too. For example when you display the user agent in an administration area. Note that "%0d%0a" is URL-encoded for "\r\n" which is a carriage-return and line-feed (CRLF) in Ruby. So the resulting HTTP header for the second example will be the following because the second Location header field overwrites the first. So attack vectors for Header Injection are based on the injection of CRLF characters in a header field. And what could an attacker do with a false redirection? They could redirect to a phishing site that looks the same as yours, but ask to login again (and sends the login credentials to the attacker). Or they could install malicious software through browser security holes on that site. Rails 2.1.2 escapes these characters for the Location field in the redirect_to method. Make sure you do it yourself when you build other header fields with user input. Under certain circumstances this would present the malicious HTML to the victim. However, this only seems to work with Keep-Alive connections (and many browsers are using one-time connections). But you can't rely on this. In any case this is a serious bug, and you should update your Rails to version 2.0.5 or 2.1.2 to eliminate Header Injection (and thus response splitting) risks. Due to the way Active Record interprets parameters in combination with the way that Rack parses query parameters it was possible to issue unexpected database queries with IS NULL where clauses. As a response to that security issue (CVE-2012-2660, CVE-2012-2694 and CVE-2013-0155) deep_munge method was introduced as a solution to keep Rails secure by default. When params[:token] is one of: [nil], [nil, nil, ...] or ['foo', nil] it will bypass the test for nil, but IS NULL or IN ('foo', NULL) where clauses still will be added to the SQL query. Every HTTP response from your Rails application receives the following default security headers. You can configure default headers in config/application.rb. Or you can remove them. X-Frame-Options: 'SAMEORIGIN' in Rails by default - allow framing on same domain. Set it to 'DENY' to deny framing at all or 'ALLOWALL' if you want to allow framing for all website. X-Content-Type-Options: 'nosniff' in Rails by default - stops the browser from guessing the MIME type of a file. Access-Control-Allow-Origin: Used to control which sites are allowed to bypass same origin policies and send cross-origin requests. Rails provides a DSL that allows you to configure a Content Security Policy for your application. You can configure a global default policy and then override it on a per-resource basis and even use lambdas to inject per-request values into the header such as account subdomains in a multi-tenant application. Use csp_meta_tag helper to create a meta tag "csp-nonce" with the per-session nonce value for allowing inline <script> tags. This is used by the Rails UJS helper to create dynamically loaded inline <script> elements. It is beyond the scope of this guide to inform you on how to secure your application code and environments. However, please secure your database configuration, e.g. config/database.yml, and your server-side secret, e.g. stored in config/secrets.yml. You may want to further restrict access, using environment-specific versions of these files and any others that may contain sensitive information. Rails generates a config/credentials.yml.enc to store third-party credentials within the repo. This is only viable because Rails encrypts the file with a master key that's generated into a version control ignored config/master.key — Rails will also look for that key in ENV["RAILS_MASTER_KEY"]. Rails also requires the key to boot in production, so the credentials can be read. To edit stored credentials use bin/rails credentials:edit. By default, this file contains the application's secret_key_base, but it could also be used to store other credentials such as access keys for external APIs. Rails.application.credentials.some_api_key returns SOMEKEY in any environment. Subscribe to the Rails security mailing list. Brakeman - Rails Security Scanner - To perform static security analysis for Rails applications. Keep up to date on the other application layers (they have a weekly newsletter, too). A good security blog including the Cross-Site scripting Cheat Sheet.